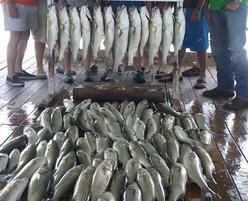 Break away from your old grinding routine and come with me on a Lake Texoma fishing trip! Many people, regardless of their age, have always wanted to know how it feels like to go on a fishing trip and learn from one of the best Lake Texoma fishing guides. Fishing can mean different things to different people. Some consider fishing to be a sport, some see it as a pastime, while to some, it is a way of life. Which ever way you look at it, fishing is always certain to deliver hours and hours of fun and excitement to folks who love the water and of course - the fish. Lake Texoma is the largest lake in the USACE Tulsa District, and is among the largest reservoirs in the US. Home to a wide array of fish species which includes White & striped bass, Blue & channel catfish, Largemouth bass, Smallmouth bass, Spotted bass, Bluegill, Black & white crappie, and many others, it is best explored with the help of experienced Lake Texoma Striper Guides who know their way around the lake and are armed with years of in-depth knowledge and experience in striper fishing, bass fishing, small mouth fishing and others. If you're up for a great time fishing with family and/or friends, get in touch with us today and you'll surely be glad you did. Create new wonderful memories with people closest to you; the kind of memories you'll cherish for a long time to come. Have fun communing with nature or appreciating the abundance of natural resources Lake Texoma has. If you're bored or stressed and are looking for a wonderful activity that offers effective stress relief, call us today and we're sure to help you break away from your same old grinding routine and help you experience the joy and beauty of Lake Texoma fishing! Call now to book your trip of a lifetime at the striper capital of the world!!!!!! Copyright © 2014 PhilsLakeTexomaGuideService.com. All Rights Reserved.